The 5-speed is covered in the Nexus dealer's manual, linked below. Shimano Nexus 3, 4, 5, 7 and 8-speed hubs are currently in production as of 2014. 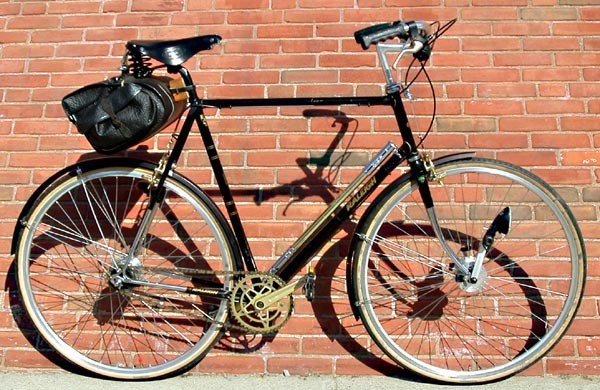 Alfine is a high-end product line with 8 and 11-speed hubs. Alfine hubs feature fancy features including optional hydraulic disc brakes and electronic shifting. 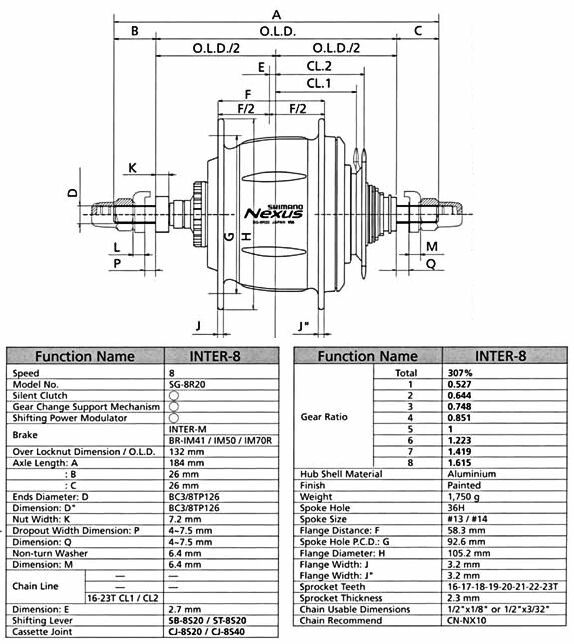 Shimano published a Nexus dealer's manual (now archived), with most of the needed information about Nexus 5, 7 and 8-speed hubs; however, there is additional information in documents (some also now in the Internet Archive) linked below and on the page for hubs with each number of speeds..
Nexus 7 and 8-speed hubs have an overlocknut spacing ranging from 127 to 135 mm, as sold: see Shimano's overlocknut spacing chart. Additional spacers can take hubs out to 135 mm. Some of these hubs have a coaster brake, and others accept the Shimano Rollerbrake, a kind of drum brake. If there is no Rollerbrake installed, the overlocknut spacing can be smaller, down to about 124 mm, using a thinner locknut. See our Rollerbrake page for information on installing and removing the Rollerbrake. Alfine hubs have an overlocknut spacing of 135 mm and a Shimano CenterLock disc-brake fitting..
Shimano sells cable-operated shifters for these hubs only for flat handlebars, but aftermarket (JTek, Microshift) shifters and a Hubbub adapter are available to fit drop bars. Some 8- and 11- speed models have electrical shifting. Electrical shifters work with drop bars or flat bars. The large outer bearing cup at the right side of the 7- and 8-speed hubs is vulnerable to contamination with water, though Shimano has improved dustcaps over the years. If the bearing cup becomes pitted, the hub shell must usually be replaced. Then it is usually most practical to replace the entire wheel. Relubrication using oil and waterproof grease is highly recommended to keep water out of the mechanism. Coaster-brakes, however, cannot be oil-lubricated; they must be lubricated with a special high-temperature grease. Do not lubricate the cassette joint (cable attachment parts) -- see advice below. The 11-speed is oil-lubricated. The page covering this hub gives more detail about this. Alfine sprockets include a protector ring which helps to prevent a loose chain from coming off. This is especially helpful if the hub is used with vertical dropouts and a chain tensioner. Most sprockets made for this system are "dished" so you can adjust the chainline by flipping the sprocket over. Because the shifter mechanism is between the right-side dropout and the sprocket, the chainline is desirably narrow in spite of the large overlocknut spacing of these hubs. The sprocket is held in position by a spring circlip (snap ring). The circlip can be pried off with a thin flat-blade screwdriver, and the sprocket can then be lifted off. The circlip snaps on, also most easily by levering it into position with a flat-blade screwdriver. Sturmey-Archer circlips, made of round cross-section wire, are easier to install than the Shimano ones with a square cross-section. After re-installing the sprocket, it is a good idea to seat the circlip by going around it and tapping with a hammer and punch. This is especially important with a coaster brake, which will become inoperative if the sprocket slips off. Gates carbon-fiber belt drive also is available for some Nexus and Alfine hubs. Alfine hubs have the Shimano CenterLock fitting, which accepts a proprietary Shimano disc brake rotor. Cable-operated and hydraulic disc brakes are available. The rotor diameter is 180mm, not the usual 185mm, raising issues of compatibility with non-Shimano caliper assemblies. The rotor is held in place by a lockring which is different from the one for Shimano cassettes, but can be installed and removed using the same tool, unless it is one with a pin to insert into a hollow axle. Several brands of adapters for common 6-bolt rotors are available. Or you can leave the rotor off, install the supplied cover for the CenterLock fitting, and use a rim brake. Aftermarket adapters are available to fit a standard 6-bolt disc. Hand operated "Rollerbrake ®". This is optional, and there is a cover for the Rollerbrake fitting. All of these systems, unlike rim brakes, are unimpaired by rain and snow, but they also have their limitations. A coaster brake can easily skid the rear wheel, but is hard to control and overheats on long downhill runs. A Rollerbrake is easier to control but also may overheat. A disc brake requires a special fitting on the frame for the caliper assembly. 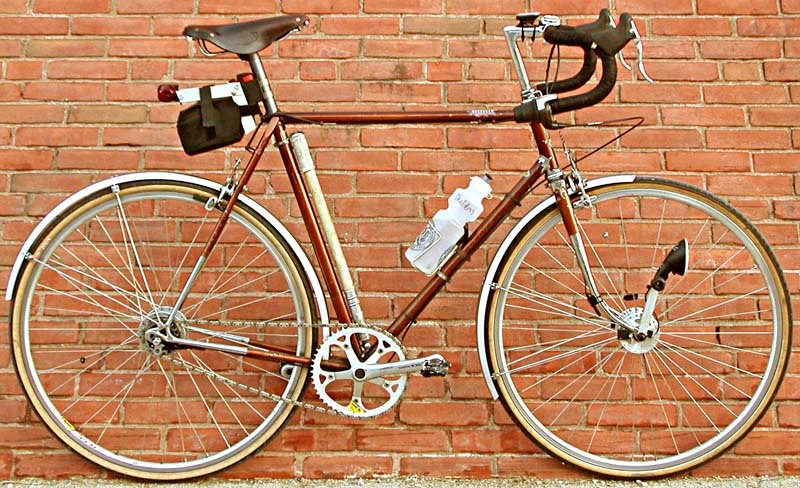 See the separate articles on this site about disc brakes, coaster brakes and Rollerbrakes. Most Nexus 3-speed hubs are shifted using a bellcrank and pushrod, as described in the article about the 3-speed hubs. Most Nexus and Alfine hubs with 4 or more speeds, and one 3-speed model, use a "cassette joint", a pulley between the right dropout and the sprocket, concentric with the axle -- a protected location which also moves the sprocket inboard, resulting in a conservative chainline despite these hubs' large overlocknut dimension. Some hubs use electrical ("Di2") shifting, with a motor unit between the right-side dropout and sprocket. Cassette joint parts are the same for the 4- and 7-speed hubs; different for the 5 and 8-speed hubs; different again for the 11-speed hubs. See this document describing differences. The photo below shows cassette joint parts for a 5 or 8-speed hub, from left to right, the driver cap, cassette joint and cassette joint fixing ring. The 11-speed hub also uses a driver cap; the 3, 4 and 7-speed hubs use none. With most of the hubs which use a cassette joint, the cable is tightest in top gear; the 11-speed hubs and the SG-7000 and SM-7000 8-speed Alfine hubs pull the cable tightest in the lowest gear. The cable engages the pulley at the top instead of the bottom with these hubs, and the cassette joint looks like the one in the picture below. Other than that, installation is similar to that of other cassette joints. The fixing ring turns clockwise to lock, same as with the others. Shifters are compatible with both types of cassette joints except that indications will read backwards 8 to 1 instread of 8 to 1 if you mix and match. The photos below show the steps in installation of the cassette joint on an 8-speed hub. 1. Sprocket and sprocket circlip are installed before the cassette joint parts. 2. The driver cap snaps on, concave side down. 3. The cassette joint is installed either of two ways, so the red dots line up. 4. The cassette joint fixing ring is installed so the yellow dots line up. Turn it clockwise to lock it. The motor unit for a hub with electrical shifting is installed with both the hub and the motor unit in first-gear position. Dots at the right end of the hub should be aligned as shown. Shimano has a special tool to align them, but this can also be achieved with careful clockwise rotation of the two notches in the ring shown in gray, using an adjustable pin spanner. The tabs in the motor unit should be aligned as shown in the next picture. If they are not, use the electrical shifter to shift the motor unit to first-gear position. There should be a rubber sealing ring just inside the indentation in the inner face of the motor unit. Install it if necessary. The smaller-diameter side faces inward. The following are instructions for the 4- and 7-speed hubs. Before installing the anchor bolt (which Shimano calls the "inner cable fixing bolt unit"), shift the hub to lowest gear (loosest cable position). Instructions for most 8-speed hubs are very similar and begin here, on page 6 of the service manual for that hub. Note that there is a second set of alignment marks, to use later when adjusting the cable. These are visible when looking down at the top of the cassette joint assembly..
Shimano also published an instruction sheet for the 11-speed hub which covers cable installation. Adjustment is made with the shifter in 4th gear for the 4, 7- and 8-speed hubs, 6th gear for the 11-speed hub. On the right side of the hub, just outboard of the sprocket, there is the "cassette joint pulley" which the cable turns as the gears are changed. Next to this is the "cassette joint bracket" which is stationary. Both the pulley and the bracket have index marks, and gear adjustment is correct when the marks on the two parts align with the shifter in 4th gear (6th gear on the 11-speed). There are two sets of these marks, one on top, the other on the bottom. This lets you see one set of marks whether the bike is right-side up or upside down. This procedure is the same for the Nexus 4-, 7- and 8-speed hubs, using 4th gear as the reference. In the case of the 8-speed, however, the marks you need to line up are yellow, not red. The following are instructions for the 7-speed hub. Instructions for the 8-speed hub are very similar and begin here, on page 9 of the service manual for that hub. The main difference is that the two dots to align in 4th gear are green rather than yellow. See the instruction sheet for the 11-speed hub which covers cassette joint and cable installation. On the 11-speed hub, the two dots align in 6th gear. Older version. Internal-gear hubs always require some system to prevent the axle from rotating, as it is used as part of the gear train. As with most other internal gear systems, Shimano uses tab washers that engage the dropout slots to keep the axle from turning. The axle flats and washer tab are not in line with each other, as with Sturmey-Archer and Sachs/SRAM hubs, and so you may have to file the dropout slots of an older bicycle to fit a Nexus hub. File only the lower edge of the dropout slots, to avoid disturbing wheel alignment. You may check your work using an anti-rotation washer: if the tab of the washer fits, the axle will fit. Except with vertical dropouts, the tab should preferably face the closed end of the dropout slot, for better engagement. Because the shift cable linkage ("cassette joint unit" in Shimano-speak) is also keyed to the axle, there are different types of anti-rotation washers to fit different dropout angles. You need to select washers for your particular frame. The 5R and 7L are nearly identical, as are the 5L and 7R, and so these pairs may be interchanged by switching sides. The 6R and 6L also may be used on the "wrong" sides of the hub for the best cable alignment with some bicycles. The 8L and 8R may be useful with forward-facing dropouts if you would like to run the cable up a seatstay. The washers are color coded as shown in the chart. There is another anti-rotation washer chart archived from the Shimano site, and it may be easier to read. The Nexus hubs were not originally intended for use with bikes that have vertical dropouts. The anti-rotation washers provided with the hub have the wrong orientation for use with vertical dropouts, and originally, Shimano said that these hubs could not be used with vertical dropouts. Shimano has reconsidered, however, and now makes available an optional set of anti-rotation washers that work with vertical dropouts. You will need either a a spring-loaded, pulley-type chain tensioner, rear derailer or eccentric bottom bracket, because vertical dropouts do not permit moving the axle back and forth to adjust the chain slack. Note, only the eccentric bottom bracket, not the chain tensioner or rear derailer, will work with the coaster brake version of the Nexus hub, because backpedaling places the lower run of the chain under high tension. Also see our article about derailerless drivetrains. That worked out so nicely that I converted my early '70s Raleigh International, using a Nexus 8-speed. I like the Nexus 8-speed a lot better than the 7-speed version. Ideally, the frame should have a drop-out spacing of 127 to 135 mm to fit one of the Nexus hubs. Older bicycles are typically narrower than that. In the case of steel (Cromoly) frames, it is usually possible to spread the rear triangle to the needed width. Any good bicycle mechanic will be able to do this, or you can do it yourself. The Alfine 11-speed is oil-lubricated, but the other Nexus and Alfine hubs are packed with a special grease as sold. Mechanical problems can result from "preventive maintenance" including re-lubrication with incorrect grease. This is especially the case if a hub has a coaster brake, due to the heat this brake generates. Metal wear particles contaminate the grease, and so the hubs require periodic cleaning and replenishment of a special grease that does not make the pawls stick. The hub must be disassembled into its major components, solvent cleaned, dried and re-lubricated. Still, frequent failures of grease-lubricated hubs due to water contamination have been reported in wet climates --see photos here. Oil lubrication, with waterproof grease for the outer bearings, avoids this problem and also allows replenishment of the lubricant without dismantling the hub. More information about oil lubrication is in the main file about internal-gear hubs. Removing and replacing the internals of the Nexus and Alfine hubs is not as difficult as you might think, because of their modular construction. If you unscrew everything that is screwed onto the left end of the axle, the whole mechanism can be pulled out of the right side as a unit. These hubs have a rotary shifter rather than a shifter rod in a hollow axle, and so you can't add oil by squirting it into the end of the axle. To replenish oil between rebuilds, you must either unscrew the left bearing cone (which requires removing the wheel from the bicycle) or else add an oiling port, such as a Sturmey-Archer oil cap. A Shimano Rollerbrake is lubricated without any disassembly, using the special Nexus brake grease -- there's a small rubber access plug on the side of the brake unit, just pop off the plug, put the nozzle of the grease tube up against it, and squeeze. Shimano Tech Tips -- older pages: structure and function, troubleshooting charts etc.